Greetings and welcome to 1963! I got to be an extra on a '60s era movie recently (though I won't type the name here until after the movie is released) and this was my outfit. How appropriate for vintage week. This dress is too big and I would have preferred it been properly pressed, but was fun nonetheless. The glasses are interesting, too - I wish I had some close-up shots! My hair was done by the hair artists and I love it. 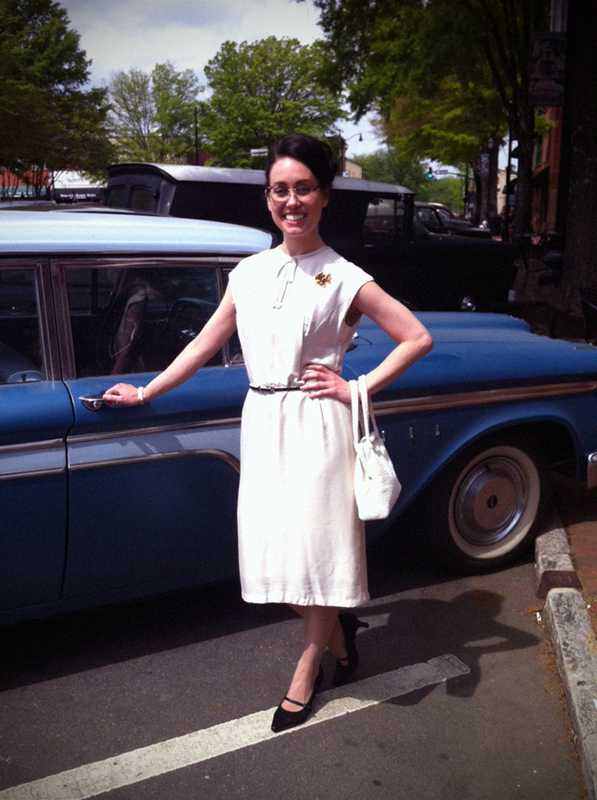 There were also lots of cool vintage cars on set (here I am with an Edsel) and I love the two girls in the background (in the dresses and white socks with Ked's, so '60s, so perfect!). 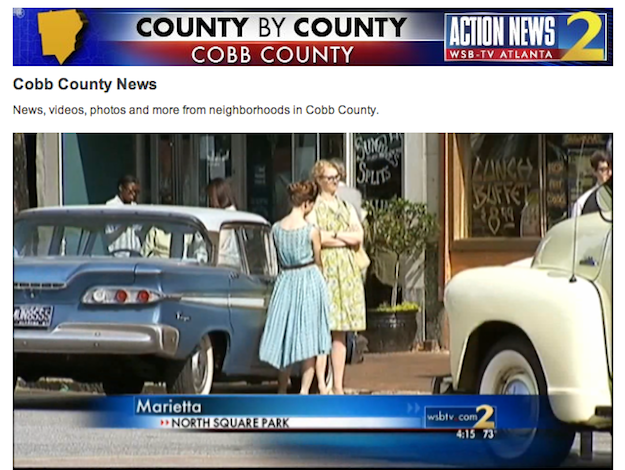 My scene was even on the local news - here is a clip with the exact car I'm posing next to. And funny enough, if this shot were a few more inches to the right, you would see me talking to the guy in the glasses (far right edge). Thanks for stopping by today - lots more vintage coming this week! Whaaaat! How did you get to do this!? Looks like so much fun and of course you look fabulous while doing it. So fun! I thought this was a photo of your mom or something from the 60's...you look perfect! 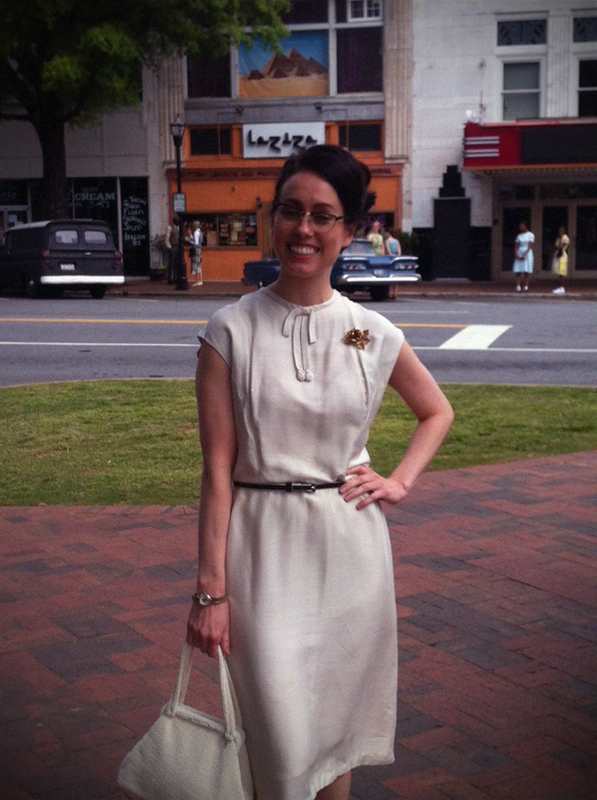 Being in period pieces are so fun (although you look a lot cuter in these vintage pieces than I do)!